A new house means clean walls, just asking to be filled with travel memories, family photos and art work. I have one piece of good art that I treasure: my triptych of paintings from Mike Bryce of Rhode Island. Although our family watercolors and pastels may not make it to an art festival any time soon, I will find frames for some key designs by my sons and myself. But I also have dozens of photos documenting trips around the world and the growth of my boys. Financially traveling is far from reality right now. But those images serve as daily reminders of where I have been and where, someday, I hope to take my children. When Megan of Easy Canvas Prints asked if I wanted to check out how they transform photos to artwork, I couldn't refuse. So last fall I sent them an image that they transferred to canvas. It was of Two Lights State Park in Maine. Rocks tumble upon rocks creating tide pools, Pollock-esque lichen paintings and vistas along the Maine Coast. It is a sight of peace and beauty. And my image arrived. Easy Canvas Prints did a fine job wrapping my image on the canvas. But when I put it on the walls, I realized I had made two mistakes. First, the size (eleven by fourteen inches) didn't capture the glory of the Park. Second, because my image didn't have enough contrast it just looked flat up on the wall. I hung it anyway and do love being able to glance at a place that holds memories for me, and after a recent visit, my sons. Megan, though, offered to do one more. This time, it would be a bigger print: 24 inches by 36 inches! With a better sense of what works, I started by jumping into the Easy Canvas Prints world of stock photos. I knew what I wanted this time: sun and the drama of mountains or the beach. I felt transported when hiking in the Canadian Rockies, Alaska and Hawaii. In each of those places I had moments where I would gasp at the natural beauty, time frozen before the Internet. Yet as much as I liked the stock photos, none were, well...mine. So, ultimately I chose a photo that I took while visiting Playa Del Carmen. The photo is from a trip to the Iberostar Toucan and remains a sentimental and emotional memory for me and a favorite for my sons. And this time I knew that between the azure of the sky, the light off the beach and the rocks, the contrast would do justice to the canvas. Once we move, it will hang in our new family/living room. There it will keep us in touch of the possibility of travel in our future. In the meantime it will bring beauty to us. Until I move, I have hung it above our couch in our main room. And this, time, this time I just want to leap into the photo. The size is perfect and absolutely captures the openness, peace, and glory of the Caribbean. Look at again on the top photo: the size just draws the eye right in. Just like last time, Easy Canvas Prints did a fantastic job of printing and wrapping the canvas. Their site was as easy to use as I remembered. Best of all, I discovered that they have a great feature where you can see how the size of the print will look over, say, your couch. 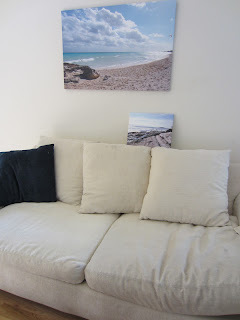 With so many walls to decorate, I hope to turn back to Easy Canvas Prints if (and when) we travel again. I have a great canvas print of one of our engagement photos from Easy Canvas Prints. We get a lot of compliments about it!